Today’s recipe is all about ZE PASTA. Don’t be afraid of the noodle people; we’re way past those days. In fact, I’m starting to think that pasta is making a big comeback and I’m not mad about it. Tony’s probably even more excited because he always says that I don’t make enough pasta. Instead I’m making pasta with allllllll the veggies, heart-healthy avocado and of course, some jazzy vinaigrette I dreamt up. 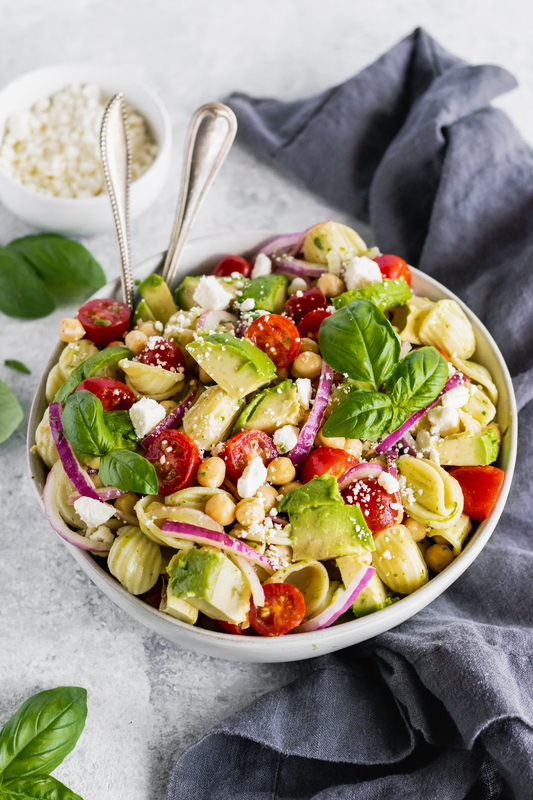 This pasta salad is nutritious, full of plant based protein (hi chickpeas) and one of my favorite recipes to bring to a party because it has SO much flavor. It’s also an amazing way to fuel up pre or post workout and makes the best lunch because the leftovers keep well. So what’s in this magical, less than 30 minute meal? FETA OR … GOAT CHEESE! AND A WONDERFUL LEMON BASIL VINAIGRETTE. If you want to make it gluten free, simply use a gluten free pasta of choice. It’s going to be FANTASTIC anyway you do it up. Serve it cold and garnish it with some extra basil. Everyone’s going to be asking you for the recipe! Tony just asked me for another serving so now you know it’s a winner. Enjoy! If you make this recipe, be sure to tag #ambitiouskitchen on Instagram or leave a comment below letting me know how you liked it. Enjoy — xo! First make the dressing by adding all ingredients to a blender. You can also whisk them together in a medium bowl, but you'll need to make sure that the basil is finely diced. I prefer the blender method because it minced the garlic for you. Set aside the dressing until pasta is ready. Next cook the pasta according to the directions on the package. Al dente is best here. Once pasta is done, rinse with cool water and drain, then add to a large bowl. Stir in chickpeas, tomatoes, feta, avocado, red onion and optional olives. Fold in dressing and gently stir until pasta is well combined. Season with freshly ground black pepper and torn basil leaves. Serves 6. Nutrition information is calculated used whole wheat pasta. 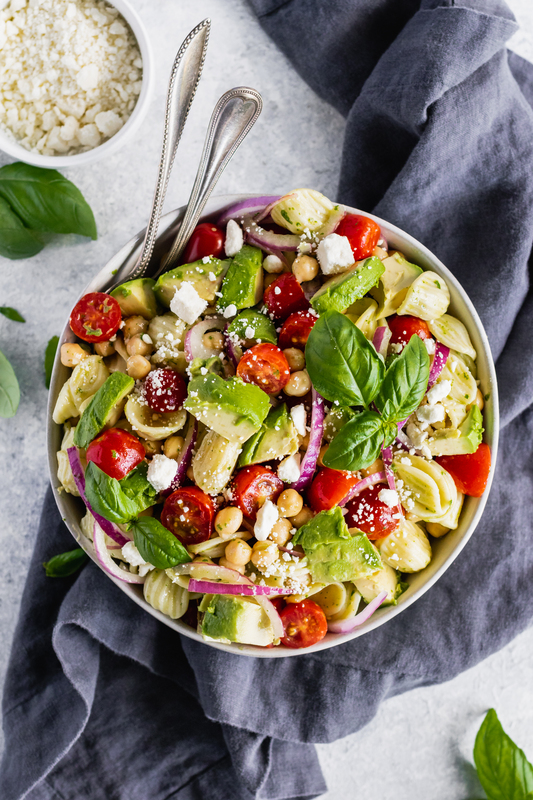 For a more protein rich pasta, use chickpea pasta or a bean pasta. TO MAKE GLUTEN FREE: Use a GF pasta such as brown rice pasta or chickpea pasta. 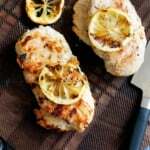 FOR A FULL MEAL: Add 1 pound diced, cooked chicken breast. TO MAKE VEGAN: Leave off the feta and use almond milk feta or a few tablespoons of nutritional yeast instead, or just leave out cheese completely. 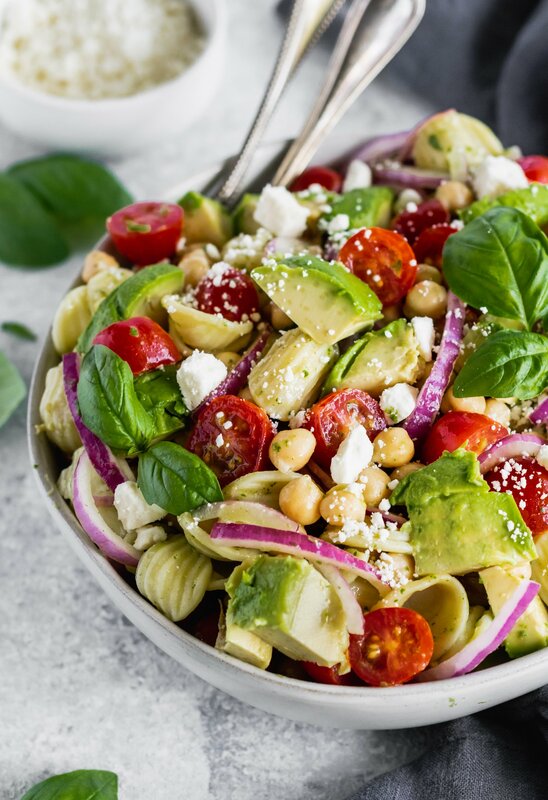 60 Responses to "Avocado Tomato Chickpea Pasta Salad with Lemon Basil Vinaigrette"
This looks beautiful! However, I need a substitute for the tomatoes and onions. What else might work to keep the colors, flavors, fullness? Thank you! Hmmm, you could try red pepper and then just leaving the onion out! I love this one because so many veggies would work in it. So glad you love this one Lisa! The lemon juice helps the avocados stay fresh, but adding them before is perfect. I could eat this pasta all summer long! It looks delicious! I love the lemon vinaigrette dressing idea. 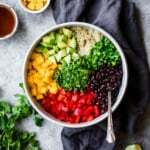 Planning to make this salad soon. It’s incredibly light and flavorful. I hope you enjoy it! As soon as I saw this recipe, I knew I’d make it. It has some of my favorite foods in it. It did not disappoint! Amazing! So glad you enjoyed it. Can I make ahead and plan to eat it as lunch for the week or will it just not keep that long? You bet! It should keep for about 3-4 days. 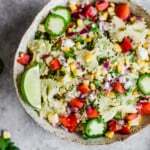 oh I love avocado salad, thank’s for sharing that recipe. Monique this salad was delicious! I am so happy to have found your site! Just made this! SO yummy. My boyfriend doesn’t like feta or chickpeas normally, and he loved it!! Monique, made this Saturday morning. The lemon and basil stand out brilliantly. This is a wonderful dish. Hi Tim! I’m so happy to hear that 🙂 Yes, love the fresh flavors that the lemon & basil add. Enjoy! 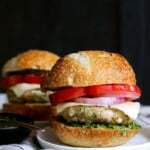 Can’t wait to make this for a summer cookout! It’s so good!! Perfect for feeding a crew of people. 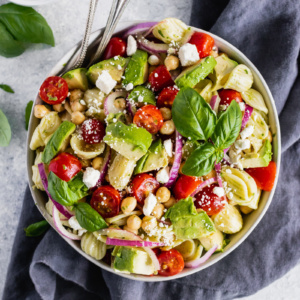 Try this salad with chickpea pasta! You’ll get more chickpea flavor and taste as well as a boost in protein and fiber! Not saying that there’s anything wrong with regular or whole wheat penne in this pasta salad, BUT it’s just an idea! Overall, this looks like a stunning recipe. I love avocados in pasta dishes. Adds the best flavor and creaminess! I’ll have to try that! I’m sure it’s delish. And YES love avocado + pasta! 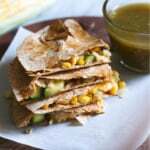 Full of health and taste thanks for shearing this recipe. Great dish! Thanks for sharing the recipe. I added cucumbers and artichoke hearts. 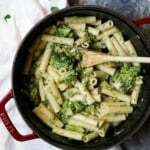 This is my new favorite pasta salad recipe! I added marinated artichoke hearts and subbed gluten free pasta and vegan cheese- delish! Love it!! So happy to hear that! I found that with the size of the salad ,there is not nearly enough dressing. It would be better to double it. You can definitely double it if you’d like! We are such big fans of this dish! I have made it for potlucks, meal prepped it for lunch, and doubled it for parties. Everything goes together super well and it’s easy to sub in whatever is left over in your fridge. Great job, Monique! There was something that was lacking for me. It was too onion forward and I feel like the lemon overpowered the garlic. Next time I might use less lemon and add one more garlic clove to the dressing. I’m guesssing the dressing is supposed to be a lightened pesto but all I could taste was lemon. 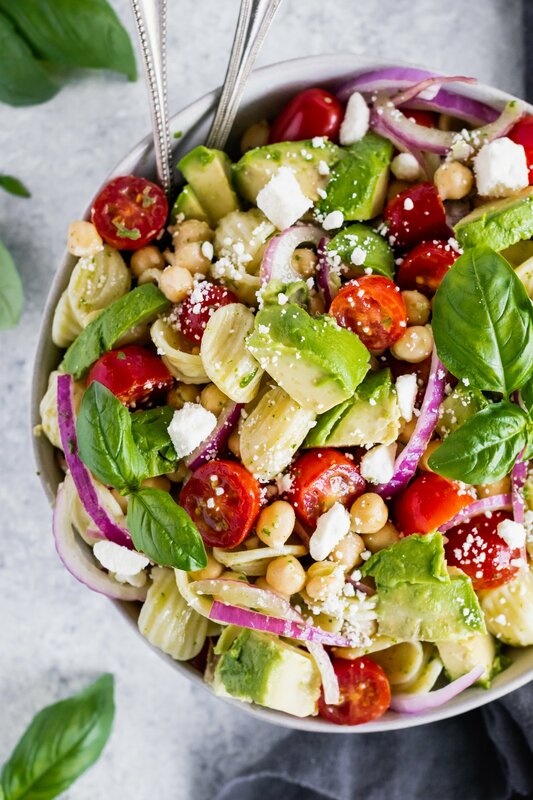 It’s definitely a fresh pasta salad good for hot and humid days. Hi Michelle – sorry to hear that you weren’t loving the flavors here! 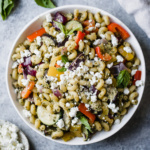 The dressing is more of a lemon vinaigrette rather than a pesto (I use it in leafy green salads, too) so it should leave this pasta salad with a fresh, citrus-y flavor. What could replace the feta cheese? Feel free to leave it out or use any crumbled cheese you’d like! Grated parmesan would also be good.